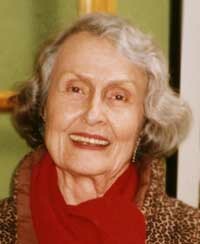 Edie Beeson Smith, 89, passed away peacefully Friday, March 2, at Blaine Manor in Hailey, Idaho. After spending the day with friends and family, draped in leopard print blankets and listening to Frank Sinatra, she made her transition and is now frolicking with those near and dear to her in her new life. Edie was born in Four States, W. Va., on Jan. 15, 1923. She grew up a coal miner's daughter, and upon finishing high school, she immediately blazed a trail to New York City. Once there, she attended Traphagen School of Fashion and began her fascinating career as a fashion editor/writer and director of photo shoots extraordinaire. Throughout her lifetime, Edie worked for Mademoiselle, Glamour, Harper's Bazaar, Vogue, The New York Times and Newsday, to mention a few. Her wit and sense of humor were quick to come across the page just as her essence of grace and glamour was so obvious when in her presence. She continued to write words and schlep clothes for photo shoots all over New York well into her mid 70s. In 1959, Edie met and fell in love with Fitzgerald (Jerry) Smith over a hot fudge sundae at Schrafft's in Manhattan. They were married a few months later, and in May 1961, their daughter, Alexandra, was born. Edie truly loved New York—the shopping, theater, museums, restaurants and interesting people that crossed her path. She traveled, meditated, chanted, did yoga, created delicious gourmet meals, swam miles every day and had a strong affection for felines. She was quite the entertainer and decorator, and when she moved to a rather conservative home in Garden City, N.Y., she hand-painted the kitchen cabinets yellow, black and white zebra stripes. From Sag Harbor to East Hampton, from Amagansett to Southampton, there was not a mile of beach that Edie didn't set foot on to enjoy long walks and dips in the ocean. Taking great joy in caring for those who couldn't care for themselves, both four-legged and two-legged, Edie spent many years volunteering her time to take care of AIDS/crack babies at Bellevue Hospital in New York. She also dedicated her time to God's Love We Deliver, a charity that provides food for those who are too sick to shop or cook for themselves. It wasn't easy to take the city girl out of the city, but in 2005 Edie and Jerry moved to Idaho to be closer to their daughter. Surviving Edie are her daughter, Alex Taylor, and son-in-law, Ron Taylor of Hailey. She also left behind her many four-legged friends: Harry, Cheri, Lucy, Emilia, Mister Kitty, Daisy and Jake. A heartfelt thanks and much love goes out to all those who took such good care of Edie, particularly the outstanding staff of compassionate, caring individuals at Blaine Manor in Hailey. A celebration of Edie's life will be held in both Manhattan and Hailey at a later date.